On March 10, hundreds of Omahans gathered by the courthouse in freezing temperatures for the Women’s Day March. Women and men of all ages and backgrounds marched the 14-block route around downtown in support for women’s rights. 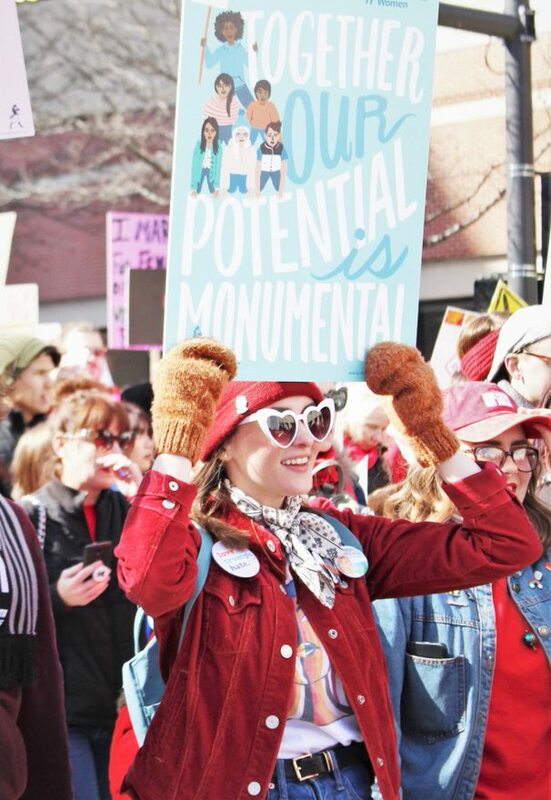 This year’s Women’s March, which was moved from its traditional January date to be the weekend after International Women’s Day, had a specific focus. Among the chants for equal pay and opposing the Trump administration, the march took on the cause of recognizing the thousands of missing and murdered indigenous women. In 2016 alone, 5,712 indigenous women and girls were reported missing. In solidarity, many of the protesters showed up wearing red. The march was also led by representatives and elders from the Omaha tribe. “I think that it calls into question the way indigenous women have been treated and not acknowledged or taken care of as well as black women and immigrant women,” emcee Michelle Troxclair said. Before the march began, speakers shared their stories and their reasons for attending the event. Many also shared poems by female authors. There was a noted effort to be intersectional, including speakers of various races, religions and gender expressions. All the speakers were accompanied by an American Sign Language interpreter and many were followed by a Spanish translator. The march itself was full of energy despite the frigid temperatures. Chanters yelled slogans such as “Women’s rights are human rights,” and “This is what democracy looks like.” Groups played music on speakers or sang into microphones. Marchers carried signs and banners. There was a constant opposition of the Trump administration throughout the march. One of the chants called during the march, for instance, was “No Trump. No hate. No fascist KKK.” The first modern women’s march was the day after Donald Trump’s inauguration. His comments about women and the claims of sexual assault enraged many feminist protesters. Several Central students also marched through the freezing temperatures.